Faced with the overwhelming military might of his adversaries, Napoleon was forced to abdicate the throne of France in April 1814.The victorious Allies banished the former Emperor to the island of Elba off the coast of Italy and installed Louis XVIII (younger brother of the executed Louis XVI) as King. It did not take long before the bumbling and arrogant tactics of the new king alienated his subjects and motivated the exiled Emperor to make a new bid for power. On February 26, 1815 Napoleon escaped the Island of Elba and landed on the French coast near Cannes. Thousands of his old soldiers flocked to his banner as Napoleon marched to Paris. By the time he reached the capital his followers had grown to hundreds of thousands and Louis XVIII had fled north to what is present-day Belgium. The Allies prepared to once again mass their forces for another attack on the French Emperor. This would take time, however. Only two Allied armies posed an immediate threat - a British force of 68,000 under the command of the Duke of Wellington and the Prussian Army of 89,000 headed by Field Marshal Blucher - both encamped in the Southern Netherlands. Seizing the moment, Napoleon led his approximately 105,000 troops north with the aim of defeating his enemies individually before they could unite. His efforts were initially successful. 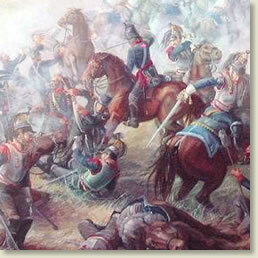 In a clash at Ligny on June 16, Napoleon routed the Prussians at a high cost. Napoleon then turned his attention to the British who made a stand at the small town of Waterloo a few miles south of Brussels. The stage was set for one of history's most famous battles. On the morning of June 18, the two armies faced off against each other. However the incessant rains of the previous days had soaked the ground to a muddy quagmire hampering the movements of men, horses and artillery. This postponed the battle until midday when Napoleon opened up with an artillery barrage. The fighting seesawed back and forth throughout the day with high casualties on both sides. Towards evening Wellington's exhausted troops seemed on the verge of breaking, but the timely arrival of the Prussians reinvigorated their efforts and doomed Napoleon. Napoleon fled to Paris where he abdicated for a second time on June 22 and was exiled to the desolate island of St. Helena in the mid-Atlantic. "On the morning of the 18th the sun shone most gloriously, and so clear was the atmosphere that we could see the long, imposing lines of the enemy most distinctly. Immediately in front of the division to which I belonged, and, I should imagine, about half a mile from us, were posted cavalry and artillery; and to the right and left the French had already engaged us, attacking Huguemont and La Haye Sainte. We heard incessantly the measured boom of artillery, accompanied by the incessant rattling echoes of musketry. I should not forget to state that when the enemy's artillery began to play on us, we had orders to lie down, when we could hear the shot and shell whistling around us, killing and wounding great numbers; then again we were ordered on our knees to receive cavalry. The French artillery - which consisted of three hundred guns, though we did not muster more than half that number - committed terrible havoc during the early part of the battle, whilst we were acting on the defensive." "About four P.M. the enemy's artillery in front of us ceased firing all of a sudden, and we saw large masses of cavalry advance: not a man present who survived could have forgotten in after life the awful grandeur of that charge. You discovered at a distance what appeared to be an overwhelming, long moving line, which, ever advancing, glittered like a stormy wave of the sea when it catches the sunlight. On they came until they got near enough, whilst the very earth seemed to vibrate beneath the thundering tramp of the mounted host. One might suppose that nothing could have resisted the shock of this terrible moving mass. They were the famous cuirassiers, almost all old soldiers, who had distinguished themselves on most of the battlefields of Europe. In an almost incredibly short period they were within twenty yards of us, shouting 'Vive l'Empereur!' The word of command, 'Prepare to receive cavalry,' had been given, every man in the front ranks knelt, and a wall bristling with steel, held together by steady hands, presented itself to the infuriated cuirassiers. I should observe that just before this charge the duke entered by one of the angles of the square, accompanied only by one aide-de-camp; all the rest of his staff being either killed or wounded. Our commander-in-chief, as far as I could judge, appeared perfectly composed; but looked very thoughtful and pale. The charge of the French cavalry was gallantly executed; but our well-directed fire brought men and horses down, and ere long the utmost confusion arose in their ranks. The officers were exceedingly brave, and by their gestures and fearless bearing did all in their power to encourage their men to form again and renew the attack. The duke sat unmoved, mounted on his favourite charger. I recollect his asking the Hon. Lieut.-Colonel Stanhope what o'clock it was, upon which Stanhope took out his watch, and said it was twenty minutes past four. The Duke replied, 'The battle is mine; and if the Prussians arrive soon, there will be an end of the war.' "
"It was about five o'clock on that memorable day, that we suddenly received orders to retire behind an elevation in our rear. The enemy's artillery had come up en masse within a hundred yards of us. By the time they began to discharge their guns, however, we were lying down behind the rising ground, and protected by the ridge before referred to. The enemy's cavalry was in the rear of their artillery, in order to be ready to protect it if attacked; but no attempt was made on our part to do so. After they had pounded away at us for about half an hour, they deployed, and up came the whole mass of the Imperial infantry of the Guard, led on by the Emperor in person. We had now before us probably about 20,000 of the best soldiers in France, the heroes of many memorable victories; we saw the bearskin caps rising higher and higher as they ascended the ridge of ground which separated us, and advanced nearer and nearer to our lines. It was at this moment the Duke of Wellington gave his famous order for our bayonet charge, as he rode along the line: these are the precise words he made use of - 'Guards, get up and charge!' We were instantly on our legs, and after so many hours of inaction and irritation at maintaining a purely defensive attitude - all the time suffering the loss of comrades and friends - the spirit which animated officers and men may easily be imagined. After firing a volley as soon as the enemy were within shot, we rushed on with fixed bayonets, and that hearty hurrah peculiar to British soldiers." Gronow, R.H., The Reminiscences and Recollections of Captain Gronow (1862-66); Keegan, John, The Face of War (1987); Schom, Alan, Napoleon Bonaparte (1997). 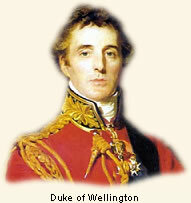 "The Battle of Waterloo, 1815," EyeWitness to History, www.eyewitnesstohistory.com (2004). Wellington's forces suffered approximately 5,000 casualties (killed and wounded), the Prussians 7,000 casualties and Napoleon 25,000 casualties plus 7,000 taken prisoner.